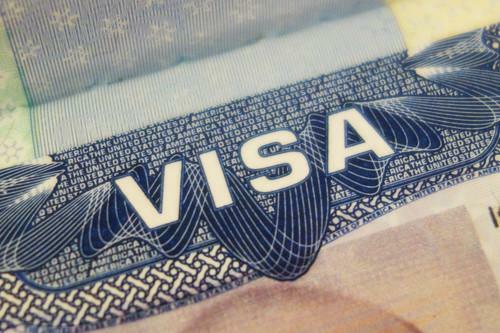 A United States visa is seen inside a passport, in this image taken on June 17, 2015. The glitch that has hit the Consular Consolidated Database has affected applications filed since May 26, and while the government hasn't provided an estimate of the number of people affected, a weeklong outage of the system last year affected 200,000 applications. An unidentified hardware failure is preventing the State Department from processing and transmitting the security-related biometric data checks at embassies and consulates. Because this data is mandatory in processing applications, the failure has halted the entire system. More than 100 engineers from the government and the private sector are working around the clock on the problem, said John Kirby , State Department spokesman, at a briefing on Wednesday. "For all the hard work, we don't expect that the system will be online before next week," he said. The failure comes as the popular summer travel season begins in the U.S. and as students planning to study in the country starting in the fall begin making preparations for travel. "We regret this inconvenience to travelers, recognize that this is causing hardship for those that are waiting for visas, and in some cases their family members or employers in the United States," said Kirby. But he added that as this is related to security of the country, it can't be bypassed. The State Department repeated an earlier assertion that the glitch is not related to a cyber security issue and is a different problem from that which it suffered in July 2014. It is advising travellers to continue checking for updates on its travel.state.gov website.